The Shenzhen Nanshan District Education Bureau superintends all schools and educational personnel in the Nanshan District of Shenzhen, China (PRC), for the delivery of high-quality civic and government education services. 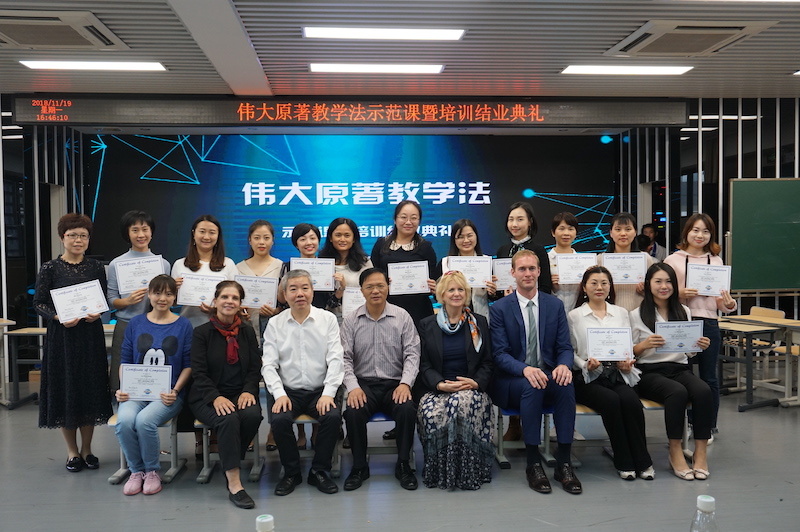 Nanshan was awarded the first district prize in Shenzhen to internationalize schools to meet 21st-century goals through partnerships with a variety of organizations and professionals. The bureau administers personnel services to more than 97 schools, including principal leadership development, teacher training, and classroom innovations, as well as new technologies for students. Liu Genping, director of the bureau, had the vision to instill the power of inquiry and critical thinking into public school classrooms. Liu recognized that by embedding the Great Books Foundation’s Shared Inquiry™ method in Chinese public schools, he could create a model for best 21st-century learning in China. He believes these strategies will transform teaching practices and create a classroom culture of inquiry in which both students and their teachers learn together. In partnership with Elisabeth Montgomery, senior adviser on internationalization for the bureau and president of educational training consultancy InterLangua, Liu brought the Shared Inquiry method of teaching and learning to Nanshan public schools. In her role with the bureau, Montgomery organizes professional development training for all teachers in every public and private school in the Nanshan District. She also serves as foreign vice principal for several Nanshan elementary schools. Montgomery opened the Nanshan Teacher Great Books Training Center in 2014 in the Southern University of Science and Technology Elementary School No. 1 to support training and practice with the Shared Inquiry method. Since its opening, hundreds of teachers have been trained and continue to attend regular Great Books meetings and discussions, as well as a monthly reading club. Since 2013, Shared Inquiry has been a featured method of professional development training for English teachers in the Nanshan District. Throughout the training sessions—the majority of which have been led by Susan Galbraith, senior international Great Books training consultant, and, more recently, Michael Elsey, president of international Great Books training—teachers get to know and understand the value of Shared Inquiry. As they begin to implement the training in their classrooms, their role transforms from teacher-centered lecturing to student-centered leading. Over the last six years, nearly 700 public school teachers have completed Shared Inquiry training, with a goal of 1,000 teachers trained by the end of 2019. Our partnership has helped accelerate the process of learning English through student engagement in the Great Books model of cooperative learning and in-depth Shared Inquiry discussions. The Shenzhen Nanshan District Education Bureau uses the Shared Inquiry method to guide its annual Dragon & Eagle Dialogues, with 2019 marking the event’s ninth year. The event, together with the Shared Inquiry method, has been more and more popular not only with public schools but also with international schools in the Nanshan District. Foster a vibrant classroom environment in which students develop the habits of effective learners while meeting key standards. The Shared Inquiry method of learning lets students’ curiosity and insights drive the exploration of rich texts. 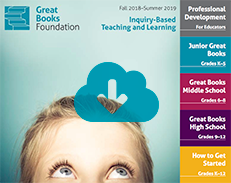 Great Books programs combine high-quality literature, student-centered discussion, and activities that support reading comprehension, critical thinking, speaking and listening, and writing. We provide outstanding classroom materials and inspiring professional development. We help students get the most out of reading and interacting with their teachers and classmates while providing instruction and support in Shared Inquiry, a method of teaching and learning that gives teachers the approach they need to help their students succeed. The Great Books Foundation, an independent, nonprofit educational organization, was founded in 1947 by two University of Chicago educators, Robert Maynard Hutchins and Mortimer Adler, with a mission to promote lifelong education through reading and discussion of outstanding literature. For more than 50 years, schools that integrate Great Books materials and our inquiry-based approach to learning into their curriculum have been helping their students become independent readers and thinkers while enhancing the instructional skills of their teachers.